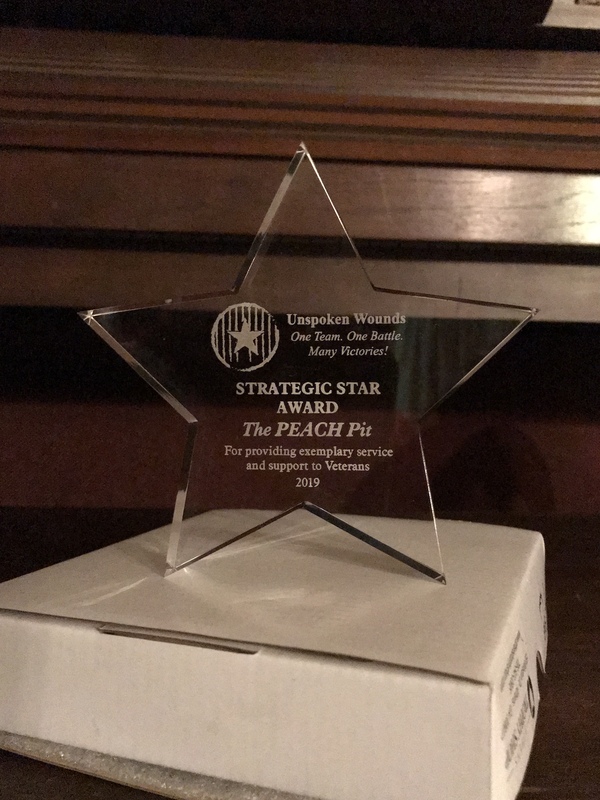 The PEACH Pit has received the Strategic Star Award as an agency providing exemplary service and support to Veterans. The award was presented March 19 during the Georgia DBHDD’s annual conference in Columbus, Ga. The goal of this year’s Department of Behavior Health and Developmental Disability Unspoken Wounds Conference was to increase the “knowledge, confidence, and skills in addressing the behavioral health, criminal justice, and reintegration needs” the state’s Veterans, active duty servicemembers and their families. We offer volunteer opportunities for the military and others in the community. The Department of Behavior Health and Developmental Disability presents this award to an agency that provides exemplary service to Veterans. The PEACH Pit Inc. is a nonprofit 501(c)(3) corporation founded by a woman Veteran. It works to help clients help themselves. Its mission is to tap into the naturally reflective nature of horses to help clients overcome obstacles to a happy and healthy life. Its vision is to ensure clients feel emotionally and physically safe enough to allow a horse to serve as part of their counseling and therapy team so they can walk away from the experience feeling more empowered to make changes. The therapy sessions include very little talking and involve activities where clients interact with horses. These interactions allow clients to focus on the present while healing from the past and looking toward the future. The sessions are unmounted, with clients on a journey of self-discovery with horses. When participating in hands-on equine-assisted therapy, clients can better understand how their current behavior and pattern may be unhealthy and practice changing those that aren’t working for them. The sessions empower the clients by helping them find their own answers based on their strengths. The agency’s primary goal is key to its service to the community, particularly lower-income Veterans: to provide low-cost, affordable mental health care to clients. To do this, The PEACH Pit receives donations through various corporate and private supporters. The agency also partners with other companies that receive funding to work with Veterans; those agencies allow Veterans to receive equine-assisted psychotherapy or other services at no cost. The PEACH Pit also is a recognized charity that receives donations through the annual Combined Federal Campaign. Finally, The PEACH Pit has an “equity payment program” that allows clients to pay what they can – without financial strain. Several Veterans have completed sessions under the program. In April 2019, The PEACH Pit is partnering with a psychologist to offer training for clinicians who work with (or want to work with) clients with PTSD. Clinicians attending the four-day training, Fundamentals of Psychodynamic Equine Assisted Trauma Therapy, can receive 20 continuing education credits, and will experience innovative applications of equine-assisted psychotherapy to work with people who have experienced trauma, with a specific focus and case examples applicable to Veterans and servicemembers. Along with having women Veterans as clients, The PEACH Pit hosts annual Horsepower and Heroes Retreatsfor women Veterans to help them realize their best selves. The Veteran’s only expense for the retreat is transportation to and from the farm in Fort Valley, Ga. The Veterans lodge in one of two modernized cabins; each cabin has one bathroom, a microwave, kitchen sink, refrigerator and bedding. The cabins do not have televisions or Wi-Fi or televisions, as the aim is for Veterans to use the weekend to focus on themselves and their needs, and not on technology. The weekends include vision-boarding, yoga, mindfulness, meditation, horseback riding, individual Accelerated Resolution Therapy, a group equine-assisted learning (EAL) activity in the arena, individual Phoenix Rising Yoga Therapy, aromatherapy and a fireside talking circle. 2019 marks the third annual Horsepower and Heroes Retreat. We don’t do this alone; we count on your support to help others. Thank you for your support. This entry was posted in Combined Federal Campaign, Fundraisers, The PEACH Pit General, Volunteer Day and tagged Awards, DBHDD.